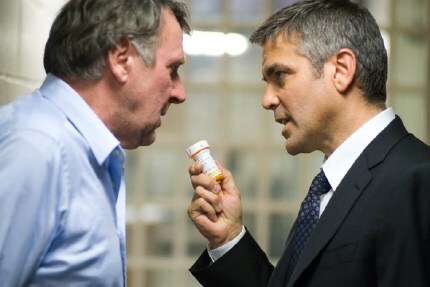 Michael Clayton stars George Clooney in the title role as THE fixer for a super-mega-gargantula law firm. When I say "THE" I mean "THE". When a client calls the law firm because he just drove away from an accident that he caused (we call that a hit-and-run, kids) they send Clayton to clean up the mess. When the firm's #1 star lawyer (played by the ever resourceful Tom Wilkinson) goes off the deep end and threatens to blow the lid off a case worth billions of dollars they - you guessed it - send Michael Clayton to clean it all up. The film, written and directed by Tony Gilroy (he wrote all three Jason Bourne movies), plays like the reading of a crime novel. It starts off rather abstractly, with seemingly disparate scenes and characters weaving in and out of our proscenium view, but eventually coalesces into a thrilling conclusion. Its similarities with the crime novel don't end there. It has car chases, cars blowing up, shadowy predators of the night watching and waiting for the kill, cops and robbers, a femme fatale, and enough snappy dialogue to make even John Huston's head spin into a Gordian knot. But don't get me wrong. Clayton does not wear a trench coat or a fedora; there's no hot 19 year old blowing smoke into his face and saying, "You do know how to whistle don't you?" Michael Clayton is not that kind of a movie. Rather, it takes those wonderful Noir sensibilities and transforms them into a look and form that the Jamba Juice generation can stomach. The acting is superb. Tom Wilkinson is affably insane as he delivers truth with every line to people who think he's merely off his rocker. Tilda Swinton comes off well as the mega-corporation's cold, efficient legal affairs liaison to Clooney's law firm. But Clooney really shines as the brightest star in this one. Do you remember a time when he used to annoy the living crap out of you? He was on a little show that you may have heard about called ER? Remember that? How he used to bob his head stupidly as he talked? Yeah, there's none of that here (thank God), only depth of character and that particular kind of soul-searching that leaves you breathless when the actor really finds "it". After all, the movie isn't called "Lawyers" or "Lawyers, Their Monkeys, and You". It's truly a star vehicle for the old ER veteran and he clearly outshines them all. I have to warn you that the movie is slow paced and the beats are a little off kilter at first. But if you really invest yourself from the get-go the payoff is rewarding. Why not "amazing" or "astonishing"? Why merely "rewarding" you ask? Truth be told, if you watch a lot of movies (which I do), the ending has an all too familiar ring to it. It's like hearing a cover of an old favorite song, but the cover, no matter how musically viable or entertaining, is a hair too similar to the original. Anyways, this movie gets a solid A. The DVD came out on February 19th so if you missed it in the theater go ahead and buy it; you won't be disappointed.